Afghanistan — Two American soldiers serving under Canadian command in Afghanistan were killed by a roadside bomb Tuesday in the second such incident this month. The pair were on a foot patrol with Afghan soldiers, looking for an ammunitions cache in the dangerous Arghandab district just north of Kandahar city. Canadian Brig.-Gen. Daniel Menard, who heads coalition forces in Kandahar province, identified them on Wednesday as Capt. Paul Pena, 27, and Tech Sgt. Adam Ginett, 29. According to military daily news Five other soldiers were injured. Word of the incident was delayed pending notification of family. Both soldiers were working with the 2nd Battalion, 508 Parachute Infantry Regiment. 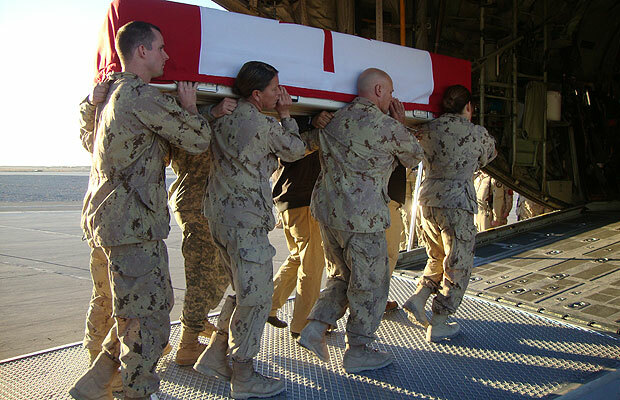 “Their loss will be mourned by Americans, Canadians and the Afghans they served with,” Menard said. Menard called Pena, of San Marcos, Tex., a “recognized leader” among his peers. A quiet professional, he always had a smile on his face and was admired by his soldiers, Menard said. Pena was deployed to Iraq in 2006 and 2007 and to Afghanistan last year. Ginett, of Knightdale, N.C., was a counter-IED specialist. He had previously been awarded the Bronze Star for heroic or meritorious achievement or service during his previous deployments. “Adam was a dedicated soldier and a team player,” Menard said. The latest tragedy involving the Americans was the fourth such fatal incident since Menard formally took command of the U.S. forces in Zhari and Arghandab less than two months ago. On Jan. 3, four Americans also under Canadian command were killed in an IED strike – in that case in neighbouring Zhari district. The four were members of the 1st Battalion of the 12th Infantry Regiment based in Fort Carson, Colo.
About 2,000 American soldiers are serving under Menard, who is trying to subdue an active insurgency in the two districts. The districts are key Taliban staging and transit points into Kandahar city – and fertile ground for insurgents to attack coalition forces and civilian convoys on the all-important Highway 1. The American forces are a crucial part of Menard’s strategy, lending muscle to the thinly stretched Canadian forces in the region.